The YIP Hopkinton program presents novelty checks to three nonprofit organizations in the final ceremony. 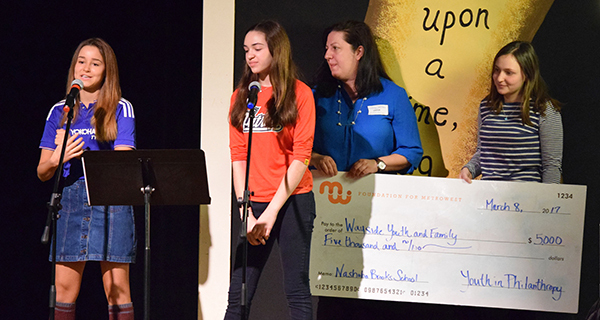 Youth in Philanthropy (YIP), a program run through the Foundation for MetroWest, aims to teach adolescents of the many ways they can give back to their community - even if they may not be endowed with the “treasure” that is so often associated with philanthropy. Through the program, high schoolers dedicate their time and talent to addressing the needs that exist in the MetroWest community. YIP runs similarly to a class, meeting once a week, with an instructor introducing key philanthropic topics, such as the different forms of nonprofit organizations, the proper way to evaluate grant applications, and the specific needs of the MetroWest area. Although some of the lessons may seem dry on the surface - such as those concerning budgets - the instructors never fail to liven the discussion by encouraging tangential conversations, and, of course, by allowing, and sometimes even providing, snacks. Every lesson ends up being involved and exciting, with an implicit message always present underneath the logistics. The program culminates with the students receiving real grant applications from nonprofits in the area. Each Youth in Philanthropy program is given the task of dividing $10,000 between two of the organizations, $1,000 of which must be raised through their own fundraising initiatives. With each class, the program seeks to fulfill four main goals: to give students the skills that they need to be active civic leaders, to help each student identify their own philanthropic goals, to improve the community through donations, and to build an overall culture of philanthropy among youth. To give participants the skills to become civic leaders, students practice public speaking by presenting to their peers and mentors. In addition, they are given the opportunity to be elected to certain leadership positions within the group, such as fundraising chair or public relations chair. To help students identify their own philanthropic goals, they are encouraged to consider the areas of community service about which they are most passionate. The Nashoba Brooks School YIP students speaking about what philanthropy means to them before presenting $5,000 to Wayside Youth and Family. 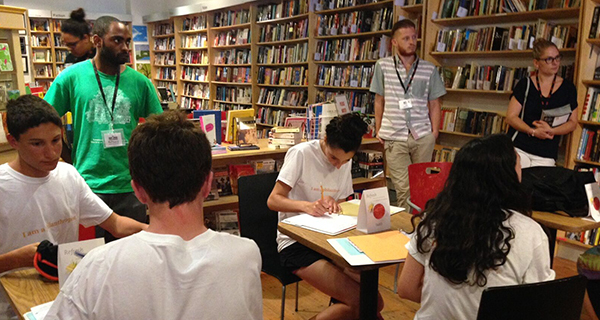 On the first day of class, YIP participants complete a worksheet titled “Issues of the Heart,” on which they are allocated an imaginary $10,000 to distribute between five broad categories of service. In this manner, students embark on their philanthropic journey by consciously considering the issues that are important to them. They are eventually able to improve the community through donations by giving $10,000 to worthy nonprofits after meticulously analyzing multiple grant applications and visiting various organizations. Perhaps the most important goal of the Youth in Philanthropy program is to build an overall culture among youth in the MetroWest area that will foster lasting philanthropic tendencies. One of the most powerful comments that Williams has to offer about Youth in Philanthropy is that everyone involved “has their own story.” Williams herself has a story with the program; she fell in love with it after working as an instructor for three sessions, and eventually worked her way up to the position of program officer. When I first became involved in Youth in Philanthropy, I had hardly any experience with community service. Most likely, I walked into the class not totally confident about what philanthropy means. The program opened my eyes to a whole new world, one where I could clearly see all the needs that existed around me. Not only did it illuminate all of the omnipresent problems in the community that had seemed invisible before, it showed me that even at only fourteen years old, I could make a difference in my community. The program introduced me to incredibly inspiring organizations, one of which I would spend my summer volunteering at. The program also introduced me to inspiring people who were fully committed to community service. It is rare to find a group of high schoolers who will tour a nonprofit, then scramble at the end to fill out volunteer applications. After completing the program, I could not leave it behind. I worked as an instructor’s assistant the following year. I felt strongly about remaining part of an organization that cared so deeply about the community, not only as a whole, but as a group of individuals, each with their own stories to tell. A YIP program visiting More than Words in Waltham, an organization that aims to provide court-involved youth with the skills they need for a successful future. Youth in Philanthropy is a program without comparison. It gives local youth the respect and responsibility to make decisions that have real-world implications and tangible impacts on the community. Community service can be done for the wrong reasons, whether it be to fulfill graduation requirements or embellish a college application. However, the magic of Youth in Philanthropy comes from the fact that it does not matter why its participants joined. Regardless of why you come to YIP, you are guaranteed to leave with an altered and more compassionate outlook on the world - one that gives you the ability to identify issues, and the skills needed to solve them. For further information about The Foundation for MetroWest and its Youth in Philanthropy program, visit yipmetrowest.org, foundationformetrowest.org, email info@foundationformetrowest.org, or call (508-647-2260). Applications for the fall YIP programs will open in April.